Tyga spoke about his comeback effort with Billboard. Tyga has had to make more comebacks than arguably anybody in recent memory. The man seems to consistently be on an up-and-down slope, either running uphill at full speed or tumbling down to an unlikely collapse. Tyga has always made fun music and while the lyrical content might not be anything to go crazy about, his songs go off in the club. "Taste" is a surefire example of that as months after its release, it's still one of the most popular songs in the world. T-Raw recently detailed how he came up with the concept for the song with Billboard and he followed up with them to discuss his current comeback effort, which is being led by the single. 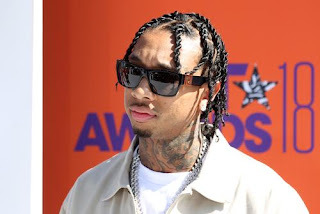 Last month, we received two new Tyga songs with "Dip" and "Swap Meet" adding to an impressive catalog of tracks that the Californian is building for the year. His current plans to release a project are unclear but it definitely seems as though that could be a possibility. His comeback effort is being pushed by his two mottos: "Don't listen to anybody" and "No one cares, bro." While the former seems like it could lead to a lot of failure, which Tyga has experienced in his career, it also brings forth a "give no fucks" attitude that can be good when experimenting with your sound. Of course, the notion of a Kardashian curse was brought up, which the rapper brushed off, telling Billboard, "Anybody that has doubted me, held me back, tried to block me behind the scenes or spread negative energy or stories on me... whoever try to curse me, it doesn't matter: The curse is broken." Read the full feature here.